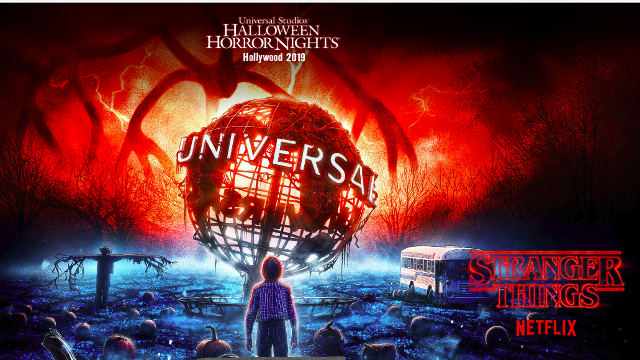 Universal Studios will be turned Upside-Down once again as they’ve announced the return of the Stranger Things maze as part of this year’s Halloween Horror Nights, appearing at both Universal Studios Hollywood and Universal Studios Orlando. Fans can expect to see elements from Season 2 and upcoming Season 3, which arrives this summer. RELATED – The Stranger Things Season 3 Trailer is Here! Stranger Things Season 3 stars Winona Ryder as Joyce Byers, David Harbour as Chief Jim Hopper, Finn Wolfhard as Mike Wheeler, Noah Schnapp as Will Byers, Millie Bobby Brown as Eleven, Caleb McLaughlin as Lucas Sinclair, Gaten Matarazzo as Dustin Henderson, Cara Buono as Karen Wheeler, Natalia Dyer as Nancy Wheeler, Charlie Heaton as Jonathan Byers, Joe Keery as Steve Harrington, Dacre Montgomery as Billy, Sadie Sink as Max, Maya Thurman-Hawke as Robin, Jake Busey as Bruce, Francesca Reale as Heather, and Cary Elwes as Mayor Kline. Stranger Things 3 will debut on Netflix on July 4. Check out the maze teaser below. Then let us know your thoughts in the comments section below.